Walsh & Albert was one of the first manufacturers in the United States to import and sell the spiral elbow, which can substantially reduce the cost of HVAC systems in all types of construction projects. Spiral elbows are manufactured using 100% United States-produced galvanized G90 sheet metal, complying with ASTM A525 standards. The completely automated manufacturing process ensures high quality at an extremely competitive cost, especially for larger sizes. This product is constructed using a Spiral Seam Elbow machine utilizing the RL-1 Spiral Pipe Lock Seam as used on spiral pipe. Quick and easy installation due to a "fitting size" 3 in. straight in and straight out along with a raised bead for coupling with spiral pipe. Drastically reduces shop labor in construction of elbow. Elbows are pulled from stock rather than spot welding or full-welding a stamped or gored elbow. Due to reduction in construction time and installation time, spiral elbows deliver significant financial savings in job costing. Compared to a stamped elbow, the spiral elbow design is comparatively stronger with less weight. 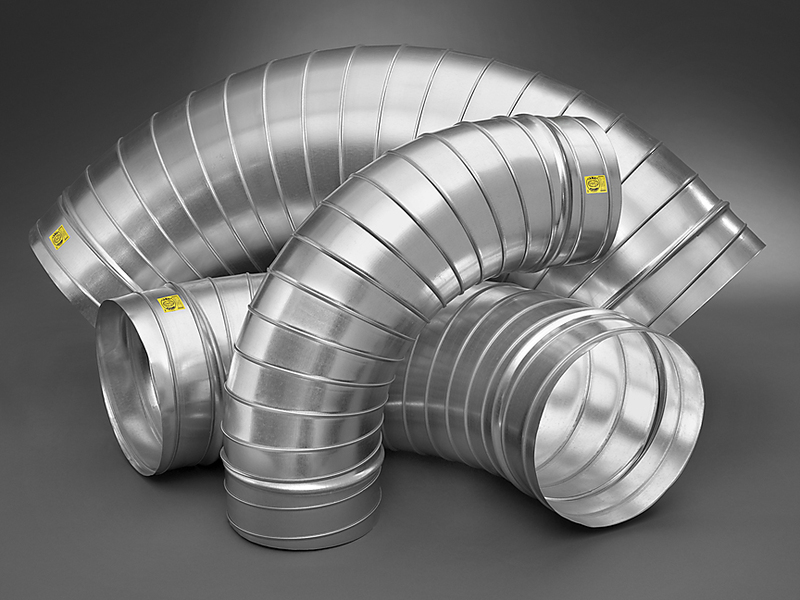 Leakage characteristics of both the spiral elbow and straight pipe are essentially the same. Spiral elbows are available in a 1.5 x radius construction from 4' up to 18' in diameter in 45 and 90 degree configurations. All gauges meet or exceed standards set by SMACNA* for these sizes.